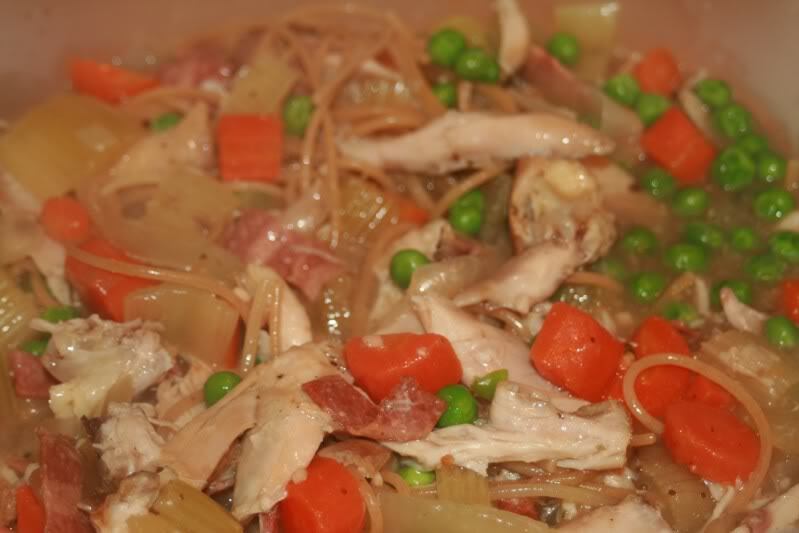 When I made the crock pot coq au vin and had all those lovely onions, carrots, and celery leftover, and all that gorgeous wine and broth that had reduced down and gotten all the flavor of the chicken, I knew I had to come up with a way to use it rather than toss it. Since we had 2 chicken quarters left as well, the options boiled down to an actual pot pie, which was the inspiration for the variation on the more traditional coq au vin or soup. As soon as coq au noodle soup popped into my head, I knew I had to make that just so I could use the name. C’mon, admit it. You laughed as soon as you read the title. I’m a goober, deal with it. So here’s my return to Kalahai Kitchen’s Souper Sundays. Let’s move on to use your leftovers, shall we? It’s oh so simple. If you’re making this after you finished eating the coq au vin for dinner, then you simply debone the chicken and add it back (careful to make sure to remove from the veggie/broth mixture any bits of bone or gristle that fell off in the cooking process). Then add the spaghetti and peas and allow to cook through. Depending on how long you let your original coq au vin cook, you may want to add a bit more chicken broth, but otherwise, it should be fine as is. If you’re cooking this another day, then just dump it all in a large pot and do the same.